Having the stamps and covers is one thing, caring for them so they end their time in your possesion in the same condition they started in is something different. Stamps and covers should be kept in an album or stocksheet, preferably not laid flat but rather upright. 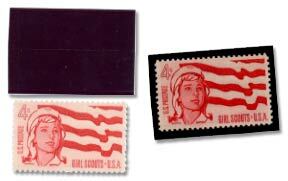 Stamps and covers should never be exposed to sunlight, even for short periods, as the UV rays will destroy the inks over time. Stamps should be kept as near to 70 degrees and 50% humidity as possible. One of the best ways to keep stamps is to mount them using a specially made mount that is chemically inert and completely wraps around the stamp protecting it from dirt, dust and oils from your skin. Shown at left is Scott #1199, the 1962 Girl Scout Jubilee issue. At far left is the stamp below an empty mount, at right is the stamp inside the mount. Mounts are gummed on the back so they can be moistened at fixed into an album. Undoubtedly the most popular method for storing stamps is in a stamp album. Albums are usually arranged by country of origin, and have places to fix the various issues. They come in many styles and varieties to suit many different tastes. The Album page pictured at left is a 1925 “Modern Postage Stamp Album”. 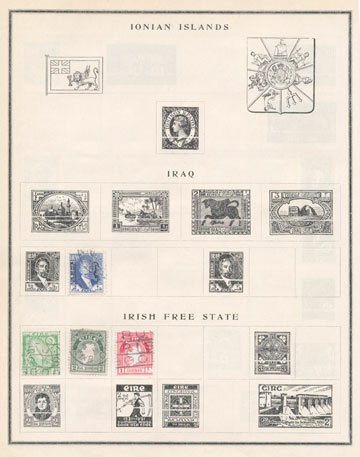 Notice that a few of the stamps from the fledgling Irish Free State have been filled in the proper places. The stamps have been afixed with hinges to the album page. Once extremely popular, hinges are small gummed strips of glassine that are wetted and stuck to the back of the stamp, then stuck to the album page. Hinges have fallen out of favor for mounting mint stamps, because the mounting process obviously disturbs the gum on the back of the stamp. Hinges also do nothing to protect the front of the stamp from dirt and fingerprints.